Our research broadly investigates how environment influences physiology and endocrine function in aquatic vertebrates. 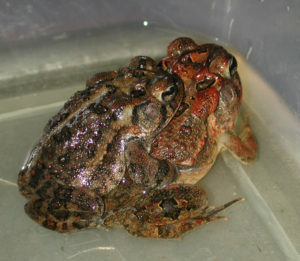 We work with fish, frogs, toads, and alligators and we’ve collaborated on rodent and bird projects. The results of our research can be used to promote wildlife and ecosystem conservation and increase understanding about human environmental health. There are three themes that permeate our research. Nitrate is an abundant environmental contaminant that comes from fertilizers and sewage. So far we’ve published 10 papers on nitrate ecotoxicology. Most recently, we tested a hypothesis, suggested by human epidemiological studies, that nitrate consumption increases risk of type 1 diabetes in young alligators. Indeed, after 5 weeks and 5 months of drinking nitrate-contaminated water, the alligators in our study developed a constellation of physiological changes seen in patients at early stages of the disease. I presented this project in May 2016 at the IUCN Crocodile Specialist Meeting in Kruger National Park, South Africa. 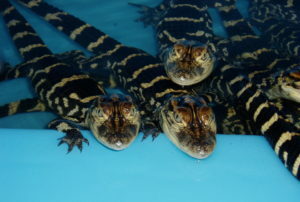 Projects like our alligator-nitrate experiment test for a phenomenon called endocrine disruption. The field of endocrine disruption investigates how chemicals in the environment – like pesticides, nitrate fertilizers, and pharmaceuticals – affect hormone-regulated development, fertility, metabolism, and behavior in animals. As a research platform, endocrine disruption studies offer students and society several benefits. First, disruption can only be understood in comparison with an animal’s “normal”, undisrupted state. In consequence, endocrine disruption research has revealed numerous novel findings about normal animal development, physiology, and epigenetics. Second, endocrine disruption is a major public health concern. 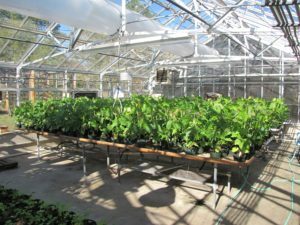 My laboratory attracts many pre-health students who find the ecological research all the more compelling because it connects directly to medicine. Finally, endocrine disruption outcomes in fish and amphibians provide critical biomonitoring tools to detect pollution in water ways and evaluate later restoration. 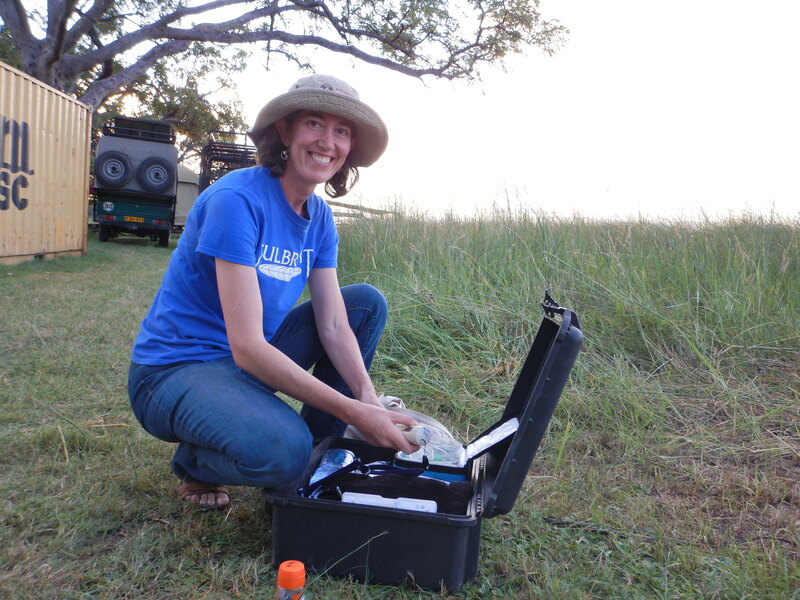 In July 2016, I returned from 7 months of field work in Botswana’s magnificent Okavango Delta, where I had the privilege to work as a Fulbright Scholar (read my blog here). The Okavango was an extraordinary opportunity that took me into the heart of Africa’s vast wilderness. I spent my childhood in the neighboring country of Zimbabwe, so the experience was also something of a homecoming. 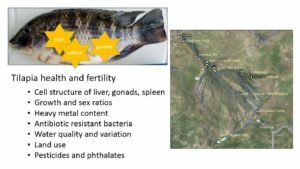 While in the Okavango, I established an initial dataset on fish reproductive health and water quality in the Delta. I am currently processing samples from my field collections. In the future, I will continue my research in the region by integrating students and building on collaborative relationships with scholars at the Okavango Research Institute. I envision projects that allow students to develop technical skills and knowledge locally that can be transferred internationally for an entirely different level of experience. The reciprocal benefit is that ecology and physiology learned in the pristine environment of the Okavango can be used to inform local studies of wetland biology and environmental health. The Okavango was recognized as a World Heritage Site in 2014. This immense wetland covers 8,000 square miles of iconic landscapes that sustain rich biodiversity with important ecological and economic value. The Delta is shaped by an annual flood of water beginning in the rainforests of Angola. It takes up to 8 months for the water to travel across the Delta’s alluvial fan: 80-90% is lost to evaporation and the rest seeps into groundwater, making the freshwater status of the Delta all the more remarkable. The freshness of the water depends on diverse and fragile elements like termites, time, trees and islands, sand, hippos, heat, reeds, and transpiration. In very real terms, the constancy of the Delta depends on flux, some of which is predictable, and some is not. How the Delta will respond to increasing human impacts and climate change remains a question of grave importance to the biodiversity and stability of the region. To understand why fish and amphibians are sensitive to endocrine disruption by a wide range of structurally different synthetic chemicals, I also study natural endocrine disruptors made by plants. Well-known examples are phytoestrogens in soy. This avenue has proven fascinating as we begin to unravel the ecology and evolution of vertebrate interactions with HAPs. Unlike manmade endocrine disruptors, HAPs may promote vertebrate fitness in certain environmental contexts. Implications for fishes and amphibians are not well understood, providing fertile ground for innovative new research.